You ever hear the expression, "They were alright until they opened up their mouths?" 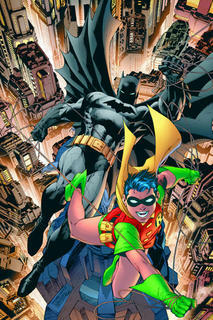 I read All-Star: Batman and Robin #1 yesterday. That wasn't the worst part of the day. I had to open the store soon afterwards, knowing full well the biggest question of the day would be, "What'd you think of it?" I swear, I know I lie on a daily basis but NEVER to a customer. I've worked very hard to earn their trust, they work very hard for their money. All-Star: Batman and Robin #1 should be a no-brainer. Batman. Robin. Frank Miller. Jim Lee. Frank Miller, the man who wrote my two all-time favorite comics, Batman: Year One and Daredevil: Born Again. Jim Lee, quite possibly, the best illustrator in comics. As a retailer, I should just be happy and watch the dough roll in, right? I can't. I'm just not wired that way. All-Star: Batman & Robin #1 just isn't very good. I can't recommend it. I was under the impression that this book was supposed to be an "all-ages" title but after reading five embarassingly bad pages of dialogued with Vicki Vale in her drawers, I saw the bar lowering before my very eyes. Miller falls back into "Sin City" mode, adding "salt" into already wounded dialogue, it seems, simply because he can. I'd love to see All-Star: Batman & Robin or anything else Miller writes for that matter, actually be edited. Not censored, edited. Frank Miller used to be one comics' strongest writers. What this title seems to lack is a strong editor willing to help direct Miller's vision. Someone who would have been strong enough to have said to Miller, "No, you can't have Batman kill. EVER." Jim Lee's art is, as always, beautiful. It's just not enough to save what should have been the event of 2005. I wanted a comic I could bookend with Batman: The Dark Knight Returns & Batman: Year One, with All-Star: Batman & Robin #1 we see Miller return to The Batman Strikes Again! form. Read it with those expectations and you'll be alright. Every site I've perused this evening had the same basic opinion as you. Oh well. In theory, lying to customers would get you more short term sales. In the long run they'd lose respect for your opinion and be less likely to try stuff you recommend (that are actually good) in the future. So you'd lose out overall. Not sure if that theory breaks down when applied to real life, but at least you'll have the respect of your loyal customers.